Microplastics (particles smaller than 5mm) from everyday consumer products such as cosmetics or car tyres pass through sewage treatment plants or are drained off with rainwater before entering our rivers, where they are carried along with the current in the water. The Netherlands is located on the estuaries of two European rivers, the Rhine and the Meuse. How many microplastics end up in the North Sea after passing through these rivers? In the Netherlands, we can measure the concentrations of microplastics to see if they are a problem for nature and perhaps for our health. But if you can model them, you can calculate in advance to see whether action will be effective. So Deltares will be working in the coming years on software that models microplastics in rivers to underpin water quality monitoring. This is important because it is becoming increasingly clear that microplastics are bad for our nature, at least in the long run. And the implications for our health will be investigated further in the coming years. By constant monitoring at different locations and times, and the inclusion of the results in a microplastics model of this kind, we will find out in time where the highest concentrations of microplastics are found in the water and where action will produce the best results. To produce a model of this kind, we need what is known as an ‘enriched effect chain’ that shows the important physical, chemical and ecological processes and variables. This chain has now been completed for various types of waters (rivers, estuaries, lakes, seas and canals). It shows that, at present, we don’t have enough data to validate the model. And there are knowledge gaps about some processes and how important they are. First of all, we need more, and sometimes more frequent, monitoring data. On the basis of those data, the model will ultimately be able to calculate the quantities of plastics entering the system, the amounts in the water column, and the numbers of microplastic particles there are in the upper layer of the soil. As soon as river water slows down, for example in a flood plain, the plastics fall to the bed. When it speeds up again, they start to move again (resuspension). If they bond to the sediment (aggregate), they become denser and so they sink to the bed faster. The dynamics of sedimentation and resuspension are important for transport. 1. At what flow rate are microplastics released from the bed during resuspension? 2. How do the water column and the bank interact in different conditions? 3. What impact does vegetation have on sedimentation and resuspension? There are also a number of specific questions for each water system. For example, in lakes and canals, to what extent do animals that eat plankton, such as mussels or shrimps, determine the amount of microplastics in the water column? And for rivers: which microplastics fraction is captured in flood plains? Work will therefore be carried out on measuring, modelling and the knowledge questions in the time to come. 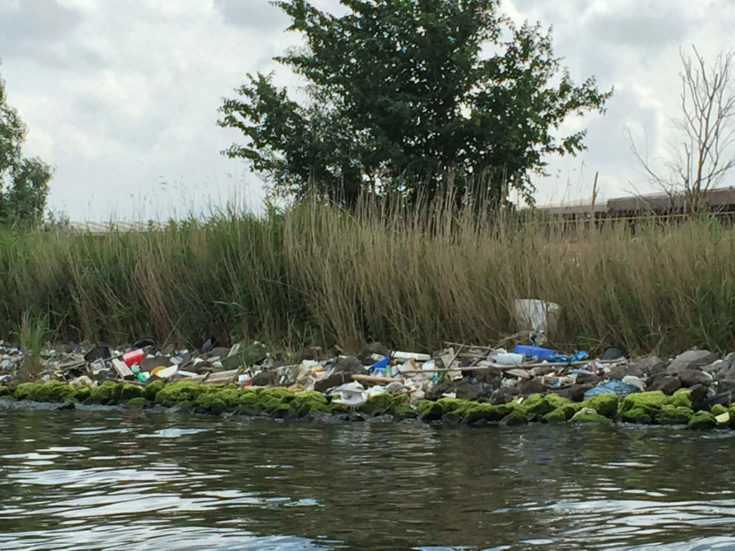 Rijkswaterstaat will intensify plastic monitoring from 2019 onwards. In the same year, a microplastics model is already being set up for ‘Rijntakken’ a protected Natura 2000 area. The first validated model results are expected in 2022. Completion of the project will follow in 2023. 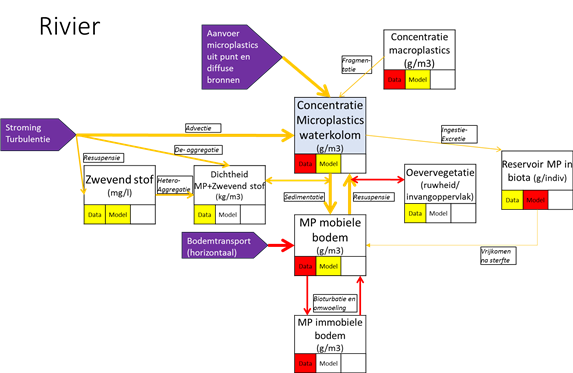 The model can also calculate the transport of smaller microplastics known as nanoplastics. This is useful because these particles, which are smaller than 0.001 mm, represent a greater threat to nature and the environment. Plastics of this size can pass through cell membranes and therefore penetrate further into the body.